Wood deck designs have gained much attraction in recent years. For this reason, this article can be significant as it is based on the importance of wood deck designs. There are several facets to building a deck: and the planning of it, ideas, design limitations, size & scales, traffic patterns, materials selections, green deck building, and other important features. In this section we are going to discuss all of these which will be very helpful for those who want their personal wood deck designs for a beautification purpose. The most important thing about synthetic deck design is that it can be a great choice for the people who really like to get their beautiful deck without the necessary required wood maintenance. Decks of different sorts of textures, profiles and colours can be built with unbelievable low maintenance charge. Furthermore, these products have guarantees for durability and quality. The next step can be thinking about the budget. It depends on 3 important parameters. They are material’s quality, cost & square footage. Quality of materials depends actually on last 2 factors that mean cost and square footage that can determine that what the produced material quality will be. Wood deck designs may cost from a maximum of $20 to a minimum of $10 per square foot relying on what types of materials you are going to use. This means a 350 square feet deck may cost from $4,200 to $7,000 if composite materials are used. So, we can tell that main wood deck designs parameter will be determined based on one’s demand or choice. Then the size of the deck should be selected. Size actually depends on some factors also. If the house is large then large deck will be harmonious with it but if the size of the house is small then large deck will be incompatible with it. No section of the deck should larger than the largest room of the house. Size also depends on the use of the deck. Unnecessary spaces should be avoided. 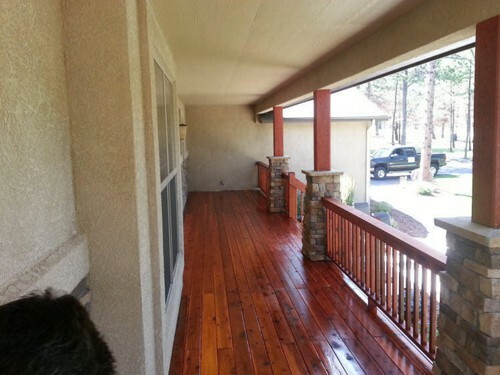 O’Leary and Sons is a well known deck refurbishing and building company. They take pride in their quality designs and work. The licensed professionals will work side by side the customer to design and build a deck that compliments the exterior of the home. They also will replace siding and fences. Their goal is customer satisfaction and beautiful exteriors. Call today to schedule a consultation.